This cooking adventure happened because of the word "slather." 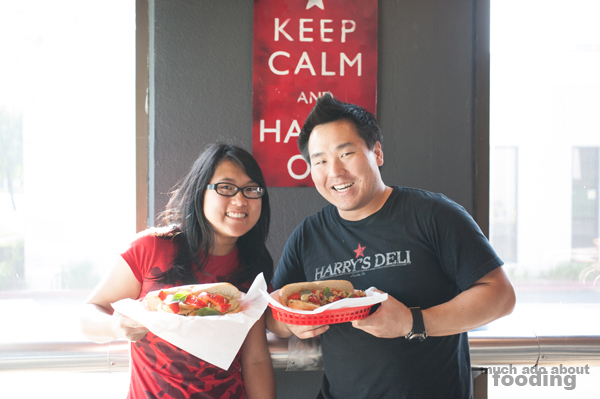 A few months ago, Harrison Kho of Harry's Deli talked about how it's been a while since that word had popped up anywhere...and he felt like slathering something onto something. 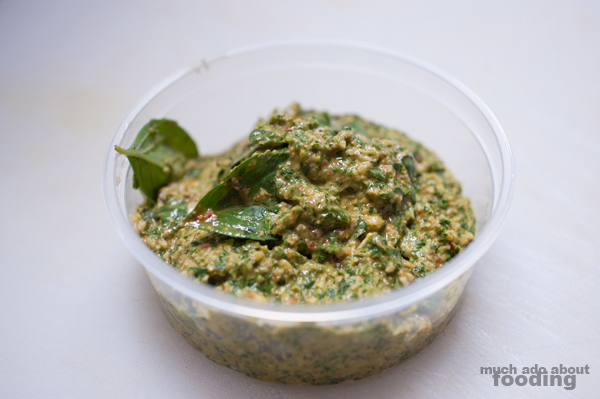 As a word lover myself, I'm a fan of the word slather and since sriracha was on my mind (I had recently purchased a jar of Jojo's Sriracha), I jumped in saying we should make a Thai pesto with sriracha. Back and forth idea bouncing happened, and we eventually decided that we needed to put together a masterpiece of a sandwich that we could call the "Thai" sandwich after its flavor profile and my last name. It was a fun afternoon, and I'm sorry that I didn't post about it earlier. As some of you may know, Harry's Deli experienced an accidental fire overnight one May day and has been closed since. I had been holding back on this post until they reopened but unforeseen circumstances have delayed the process. I realized I shouldn't postpone this article any more though and hope that soon after this, they'll be able to open their doors again to everyone. After all, Harry makes damn good sandwiches. 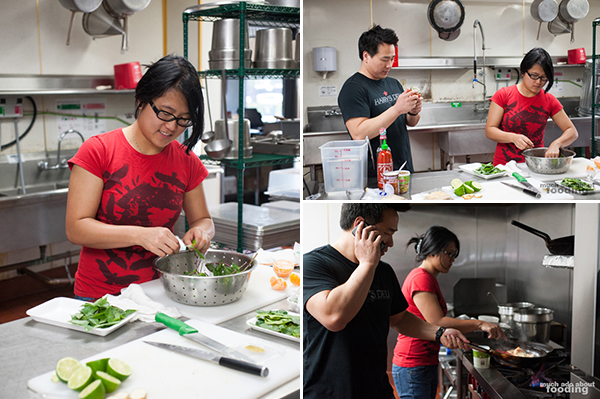 We came after the typical service hours with some ingredients in tow and ideas on our mind. Harry had his own plan too and had loaded up on the necessary ingredients as well. I love cooking but my ardor for it does not compare to the passion Harry has for it nor do I possess the same dexterity he does in the kitchen. 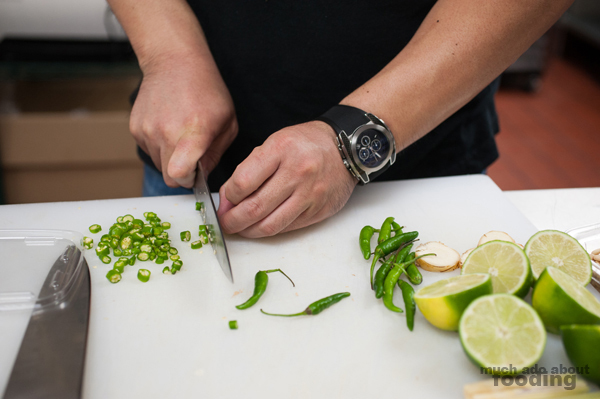 He has been cooking and experimenting since 17, teaching himself all of the basics and rudimentary skills before moving on to more out-of-the-box creations. 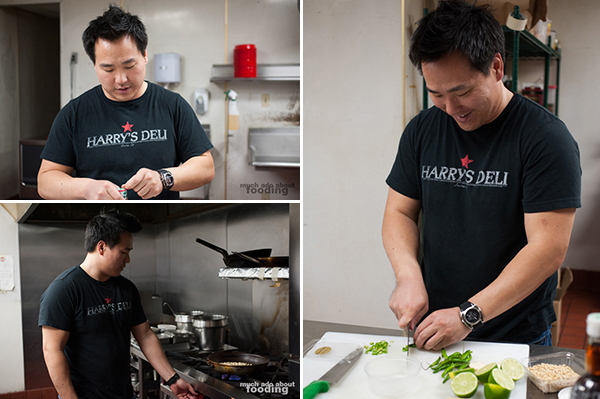 Harry's Deli was the result of a dream he had to one day own a sandwich shop and is just the beginning of what we foresee as a line of restaurants his culinary passions will showcase. I've loved everything I've had there so far, especially the onion rings. We were captivated by how quickly he prepped a lot of the ingredients needed for our collaboration sandwich. The first step: making a variation of a typical Italian pesto. What other tastiness could we slather onto something anyhow? Forgive the end result picture - it doesn't look very appetizing but trust us, it was good. Sriracha was the firestarter for this idea; all the other pieces fell into place once we talked about calling it a Thai sandwich. 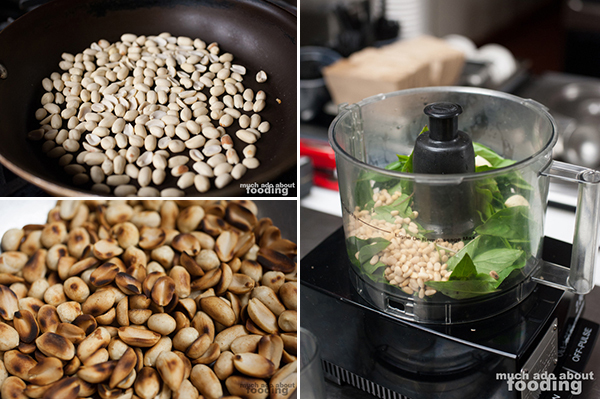 We still used pine nuts but replaced sweet basil with Thai basil and some pine nuts with roasted peanuts. Jojo's sriracha came into play as well, lending a sweeter spice to it all. I can't share the full recipe with you all but trust me, it was a welcome rendition. 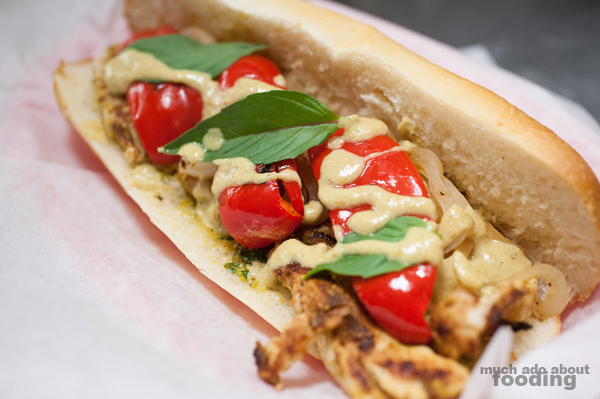 To see what would work best, we experimented with two types of chicken breast for the sandwich. 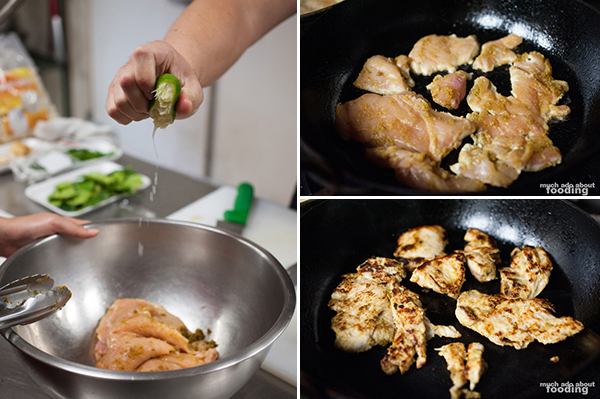 One version was a Thai green curry dry-rubbed chicken breast. Admittedly, due to the short production of this sandwich, we used a paste instead of making everything fresh but it's definitely possible to make it in the future fresh. Rubbed in well and left to sit for a bit, the chicken breast got a squeeze of fresh lime before being exposed to a hot skillet. 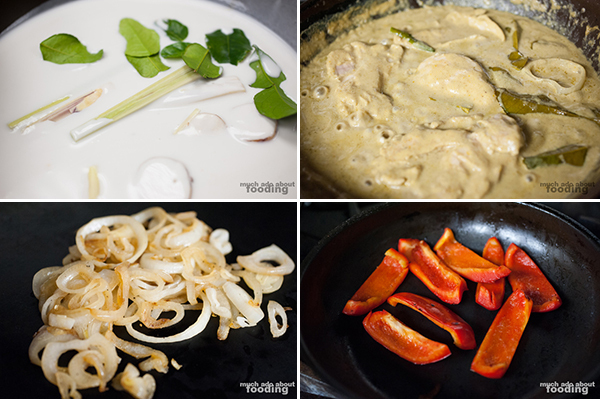 The other version was a Thai green curry poached chicken breast which sat in a green curry accentuated with fresh lemongrass, kaffir lime leaves, and sliced turmeric. Caramelized onions and roasted red bell peppers awaited topping our chicken pieces. The bread? 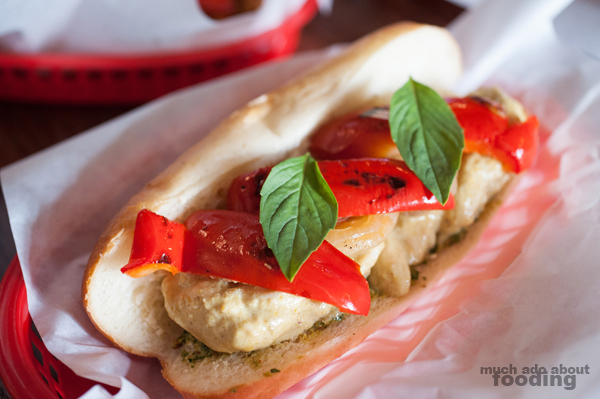 Beautiful banh mi-style baguettes from OC Baking Company. The result? A tasty, spicy duo of sandwiches sure to make anyone want a piece. We agreed that the dry-rubbed style made more sense as a sandwich with some green curry drizzled on; the poached version was a bit too messy. 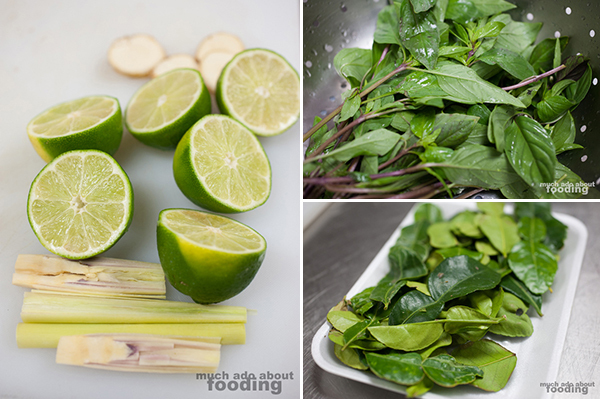 The Thai pesto made a heck of a lot of difference in flavor too by giving us more Thai basil bang for our buck. The roasted peanut flavor shone through beautifully and next time this sandwich happens, we'll be sure to add in some crushed roasted peanuts AFTER the pesto has been pulverized too. It came in crunchy bursts, making the sandwich more fun to eat. Maybe you could make your own at home or maybe you'll just have to beg that this be added to the menu (or secret menu...maybe?). We also shot fun little vids of the sandwich assembling - check it out below and make sure to keep in touch with Harry's Deli in Irvine for when they re-open. You really need to get some of his sandwiches, STAT! Thanks, Harry, for letting me cook with you! 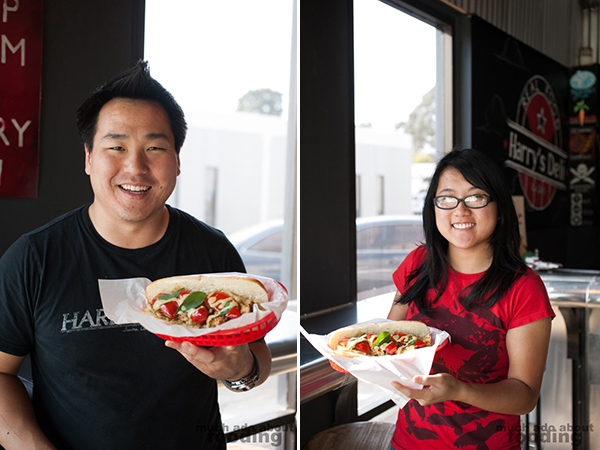 Photography by Duc Duong who salivated the whole time and Minerva Thai when she could. More photos available on Facebook here.